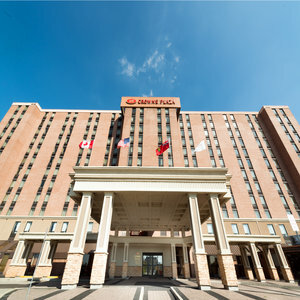 Welcome to Crowne Plaza Toronto Airport You'll find great service, fully-equipped meeting facilities and award-winning dining at Crowne Plaza Toronto Airport , located just two kilometers from Lester B. Pearson International Airport (YYZ) and 25 minutes from downtown. Our 24-hour airport shuttle and long-term parking services take the stress out of travel, while our 24-hour business centre and complimentary high speed wireless Internet access ensure you're always connected. With 12,000 square feet of meeting space and our dedicated Crowne Meetings Director to handle your meeting details, you'll travel for success at Crowne Plaza Toronto Airport . Business travellers will also appreciate our close proximity to the Toronto Congress Centre , International Centre , Pearson Convention Centre and many corporate offices. Leisure travellers can take advantage of Torontos greatest shopping and attractions, including the Eaton Centre , Rogers Centre , Air Canada Centre and CN Tower , which are just 25 minutes away by car, while the Woodbine Racetrack & Casino is less than 5 kilometres away. Unwind and recharge in our heated indoor pool, whirlpool, sauna and 24-hour fitness centre. Dont forget to enjoy a drink and a great meal prepared by our award-winning culinary team at La Brasserie and Rendezvous Bar and Lounge .